Responsibility is simply, our ability to respond—and building that ability. On the farm, this is the care—both routine chores and larger projects—that we give to our growing crops. 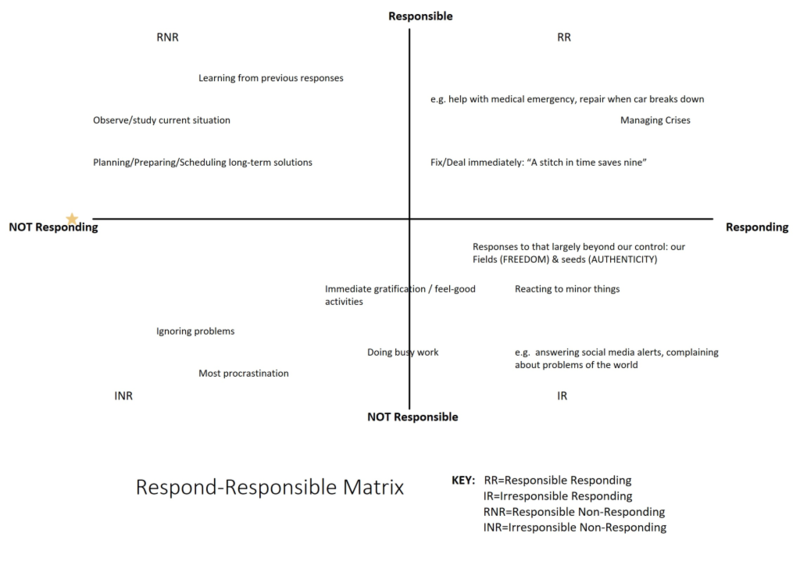 Responsibility is not the same as responding. In fact, sometimes choosing not to respond develops—or preserves—our response-ability. Respond is fast, automatic, frequent, emotional, stereotypic, subconscious. Ability to respond is slow, effortful, infrequent, logical, calculating, conscious. Of course, System 2 / Responsibility entails much more effort, which often isn’t sustainable over the longer term: i.e. dreaded lessening of our ability to respond. So, the solution is for System 2 to “delegate” work to System 1: see the FARM Hands (particularly, The Habitué & The Heuristician) for examples. Responsibility should not be confused with duty. Nor with burden—except in the sense that lifting weights burdens muscles and aerobic exercise burdens the heart temporarily. By doing so, it develops the body’s ability to respond to stress and demands upon it. Freedom’s flip side is responsibility. While freedom defines the spaces we have, responsible action is 1) within those spaces. 2) It also utilizes our gifts and talents, our seeds of potentiality. 3) And, looking forward to the final stage, it’s worthwhile. Moreover, such actions are most likely to be sustainable: they engage us, they challenge enough that we avoid boredom, yet not too much which creates anxiety. This sense of engagement found between anxiety and boredom is commonly known as flow.